For the heat of August, SHRIEK: Women of Horror brings you the excellent Persian film UNDER THE SHADOW. A mother and daughter living in Tehran during the Iran-Iraq war must learn to trust one another to survive war, religious fascism, misogyny, and menacing supernatural entities. Part of SHRIEK’s commitment to feature more films with people of color in front of and behind the camera, please join us for this conversation. If you loved THE BABADOOK, we’re betting you’ll love UNDER THE SHADOW! As usual, reading further will contain some spoilers. There’s a certain subgenre of horror that focuses on contained, domestic spaces. This kind of horror has been on the rise recently. THE BABADOOK, THE WITCH, HEREDITARY, and arguably even GET OUT can be classified as domestic horror. As opposed to cliques of teens running around the woods or suburbia and getting hacked to pieces, domestic horror usually focuses on multiple generations of families, especially the women. It would be a myopic mistake to consider UNDER THE SHADOW simply a Persian Muslim version of THE BABADOOK. There are certainly similarities: a missing father, a mother going through grief, a child increasingly difficult to discipline and control, and a dark, fluid entity in a basement showdown. 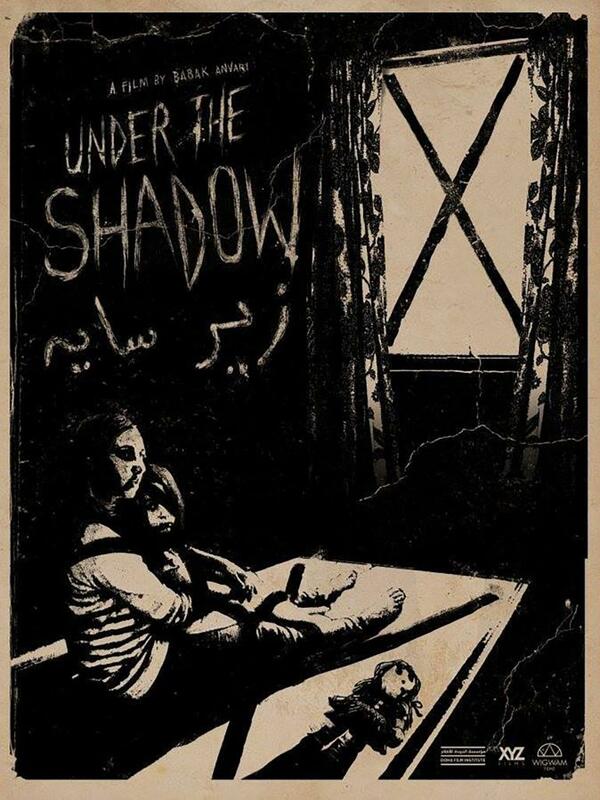 But UNDER THE SHADOW effectively recontextualizes the horror of the home. Aside from menacing entities that may be real or imagined, the reasons the mother and daughter spend so much time at home have much to do with the Islamic Revolution and subsequent Iran-Iraq war. Shideh, the mother, is prideful, not wanting to leave her home and her city during an escalating war. However, she has been denied an education, and thus a career, due to her youthful leftist politics during the Revolution. She has nothing to do but keep house, raise her daughter Dorsa, and work out to illegal Western aerobics video tapes. When she leaves the house, she has to cover her hair and figure or risk being arrested for indecency—and that’s exactly what happens. After a terrifying encounter with the entity haunting her home, she flees into the street, hair exposed, and is immediately seized. This film is still more important as a beautiful example of the new wave of international horror, particularly horror films from the Middle East. UNDER THE SHADOW can be connected with films like BASKIN and A GIRL WALKS HOME ALONE AT NIGHT (the latter shown at SHRIEK in 2015). I’m going to dare to say that the haunting isn’t (or needn’t be) a metaphor for the mother’s grief over losing her mother, her career, her country, and her freedom. The regime that strips Shideh of her liberties intensifies the immediate danger of the spirit in her home, but also vice versa. While THE BABADOOK is often (with writer-director Jennifer Kent’s approval) taken as a direct metaphor suppressed grief, UNDER THE SHADOW cannot be so easily defined. Join us Sunday, August 19th, to talk about this groundbreaking film! ← New Releases for August 14!